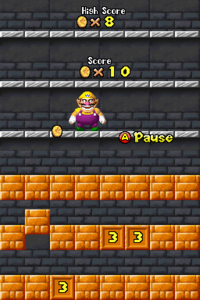 Coincentration in New Super Mario Bros.
Coincentration is a Super Mario 64 DS minigame in which Wario punches a Moneybags and coins fall out of the sky into Brick Blocks. It later appears in New Super Mario Bros. as a multiplayer and single player Puzzle minigame. Its name is a portmanteau of "coin" and "concentration." With the stylus, the player must tap the bricks in which the coins fall. If the player taps a brick that has no coins, the game will end. The highest score that the player can obtain in this game is 40, which is the "Perfect" score. In the multiplayer version in New Super Mario Bros., the same thing happens, but each player takes turns choosing a block. If a player taps a block with no coins, the block will break, and the player will lose two coins (can go below zero). Once all the coins are found, the person with the most coins wins. Pay attention to where the falling coins land. Touch the blocks to retrieve the coins. But if you choose the wrong block, your game will end. The music that plays during this minigame, which in turn is an arrangement of the underground theme from Super Mario Bros., was recycled in New Super Mario Bros. as the music for Whack-a-Monty. An arrangement of it is available as a track that can be played during events in Mario & Sonic at the Olympic Games (Nintendo DS version), Mario & Sonic at the London 2012 Olympic Games, Mario & Sonic at the Sochi 2014 Olympic Winter Games and Mario & Sonic at the Rio 2016 Olympic Games. This page was last edited on March 25, 2019, at 22:25.